How To Be Single is a 2016 American romantic comedy film directed by Christian Ditter and written by Abby Kohn and Marc Silverstein, based on the novel of the same name by Liz Tuccillo. The movie stars Dakota Johnson, Rebel Wilson, Alison Brie, and Leslie Mann. It premiered on February 12, 2016 and was released by Warner Bros. Pictures. 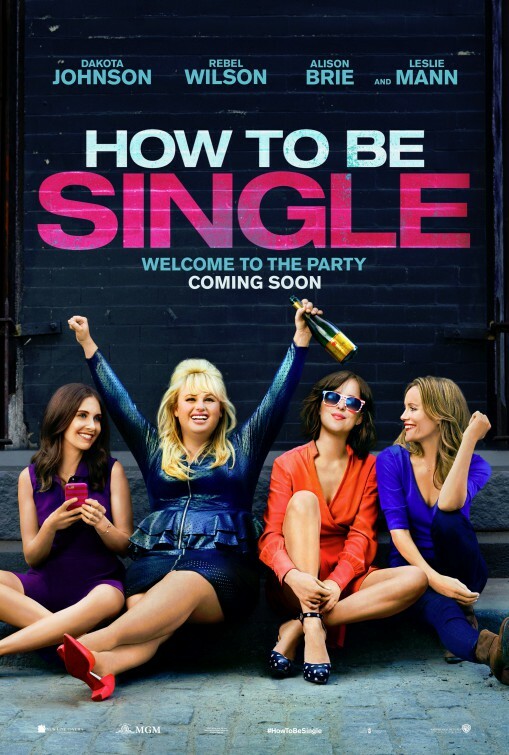 How To Be Single has received mixed or average reviews from critics. The story goes like this: There's a right way to be single, a wrong way to be single, and then...there's Alice. And Robin. Lucy. Meg. Tom. David. New York City is full of lonely hearts seeking the right match, be it a love connection, a hook-up, or something in the middle. And somewhere between the teasing texts and one-night stands, what these unmarrieds all have in common is the need to learn how to be single in a world filled with ever-evolving definitions of love. Sleeping around in the city that never sleeps was never so much fun. How To Be Single is of romance and comedy genre, which runs for approximately 110 minutes. It's Rated R in most countries for sexual content and strong language throughout. It's definitely a feminist movie, focusing much on the trials of women when it comes to love, career and social relationships. But because of Rebel Wilson, I actually quite enjoyed watching it and was able to relate to some scenes in the movie. There were also a lot of quotable quotes from the movie that you can use in real life. The film was able to successfully show the different types of single people in the city. There were those who really wanted to be alone, some who were desperately looking for love, and some more guys who are somewhere in between. That said, promiscuity, drinking, partying, and drug abuse were heavily shown in the movie, which would definitely limit its audience. Those also made the lives of some characters quite shallow and superficial. But overall, it was a fun movie to watch and definitely worth your time and money.